Time of Origin: Began life on Kastria approximately 150 million years in the distant past; confronted The Doctor on Earth in the 1970s. Appearances: "The Hand of Fear" and "Eldrad Must Die!" History: One of the more ancient and durable beings The Doctor has ever encountered, Eldrad operated on a scale of evil that was so terrifying that his entire race actually committed suicide en masse rather than risk the chance that he would return, one of them dedicating her life to Eldrad’s permanent destruction even after the rest of her race was annihilated. Although precise details of Eldrad’s history are unknown, it is known that he was the ruler of the planet Kastria and the silicon-based Kastrians in the distant past, responsible for creating the barriers that his people depended on to protect their surface population from the solar winds. However, when his people objected to his plan of galactic conquest, Eldrad destroyed the barriers, his people subsequently rebelling against him as their planet began to freeze to death. The Kastrians placed Eldrad in an obliteration module with the intention of remotely detonating it, but when the collapsing solar barriers forced them to detonate early or lose radio contact as their equipment shut down. As a result, Eldrad’s body was spread out across the universe, parts of him trapped in various locations on a variety of worlds, a particularly dangerous flaw as silicon life-forms have their genetic matrix set in stone, allowing them to regrow from tiny fragments if subjected to the right form of energy. Eldrad’s hand and the ring containing his genetic signature were eventually discovered on Earth in a quarry in the 1970s during a dig. When Sarah Jane Smith accidentally came in contact with the hand after she and the Fourth Doctor materialised in the quarry where the hand had been found, the hand’s ring was able to exert control over Sarah’s will, prompting her to take the hand to the nearby Nunton Research and Development Complex, a power plant with at least two nuclear reactors, after she regained consciousness. While the reactor’s excess radiation after Sarah triggered an overload was enough to animate the hand - which absorbed all the radiation without affecting Sarah in the slightest -, it took a nuclear missile strike by the RAF and the subsequent destruction of the reactor to release enough energy for Eldrad to make a new body for himself based on the genetic signature of the ring. Although this new form resembled a human female as Eldrad had been using Sarah’s form as a template as she was the first person to come in contact with the hand, Eldrad concluded that this form would suffice for his/her current purposes. With Eldrad’s regeneration complete, The Doctor and Sarah confronted ‘her’, Eldrad using unspecified mental powers to determine that The Doctor was not responsible for the attack against her, as well as determining that he could be trusted. Learning that The Doctor was a Time Lord, Eldrad requested that she be taken back to Kastria at the moment of her destruction - claiming that the solar barriers were destroyed by an interstellar war rather than by her and that she had been executed by the same race -, but accepted The Doctor’s compromise offer to take her back to Kastria in the present when he refused the original request on the grounds that it would violate the first law of time. Arriving on the now-barren Kastria, The Doctor, Sarah and Eldrad travelled through a series of traps that King Rokon, Eldrad’s successor, had left in the underground thermal buildings - perpetually powered by the heat from the planet’s core - that were all that remained of the Kastrian civilisation. Although one trap managed to fatally wound Eldrad by infecting her with an acid that would eventually cause her molecular structure to collapse, she was able to make it to a regenerator chamber that was able to restore her to her true, male form, subsequently revealing her true past and agenda to The Doctor and Sarah (Although The Doctor had already suspected that Eldrad was the villain as the defences they had encountered were specifically designed to affect silicon life-forms like the Kastrians; silicon life was so rare that The Doctor doubted that there could be two such races in close enough proximity to wage war against each other at such a remote, early point in galactic history). Investigating the throne room, Eldrad activated a recorded message left by King Rokon, which revealed the final fate of the Kastrians. Despite the fact that there had been only a one in three million chance of Eldrad surviving in some form under the circumstances of the module’s destruction, the remaining Kastrians had nevertheless elected the option of final oblivion, allowing themselves to die rather than continue to live a miserable existence underground, even destroying their species’ race-banks - a store of 100 million crystals that could be used to create a new race of Kastrians -, committing mass suicide rather than take the chance that Eldrad would return to try and take control of their species once again. 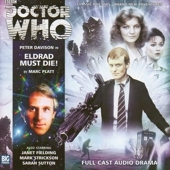 Outraged at Rokon’s last message hailing him as the King of Nothing, Eldrad pursued the fleeing Doctor and Sarah, intending to force them to take him back to Earth in the TARDIS so that he could conquer it, but they were able to get far enough ahead of Eldrad to set up The Doctor’s scarf as a tripwire, causing Eldrad to fall into a deep chasm a short distance outside the throneroom, apparently ending his plans of conquest once and for all. The Fifth Doctor found himself facing Eldrad once again when the TARDIS arrived on a beach that was the subject of a survey into recent radioactive activity by the Amberneith Seacology Centre, headed by Kate Sherrin ("Eldrad Must Die!"). When Turlough and Nyssa found a dead bird with crystals in its wings, The Doctor volunteered his services to investigate the radiation in the area, as well as the recent mass deaths of local fish and birds. Settling into the local village, The Doctor and his friends met Charlie Gibbs, an old associate of Turlough’s from school ("Mawdryn Undead") - and another exile from his home planet ("Planet of Fire") -, who was making arrangements to acquire the ‘Watcher’ for a mysterious other, intending to use Turlough as an agent to further their goal. Visiting the Seacology Centre, The Doctor learned that the centre had taken in a beached white whale that had been contaminated by crystalline fragments, his and Nyssa’s attempt to communicate with the whale allowing him to detect the whale’s ‘message’ of "Eldrad Must Die", but was so occupied with this analysis that he missed Turlough falling under Gibbs’s influence as the crystal in his watch began to mutate and grow over his arm. With Turlough under Kastrian influence, Tegan Jovanka took the centre’s jeep to try and rescue him while The Doctor, Nyssa and Kate attempted to investigate the island, which had been used by the government as a dumping ground for depleted uranium. Unfortunately, most of the villagers had been contaminated by the crystals, forcing The Doctor to retrieve an inflatable dinghy from the TARDIS before the beach began to swallow the TARDIS and tried to trap them in a vortex. Tegan and Turlough discovered that Turlough had been sent to retrieve one of Eldrad’s eyes from a collector, but the eye took control of Gibbs, driving him to seek Eldrad’s resurrection even as Turlough escaped with Tegan. Trapped on the hardened sea, The Doctor attempted to provoke Eldrad - who he believed was responsible for recent events - into showing himself, revealing a large quartz ‘iceberg’ with the nuclear icebreaker HMS Alexander in the centre, which was under the control of Mulkris, a Kastrian assigned to ensure Eldrad’s death by finding his scattered fragments. Although The Doctor managed to convince Mulkris that he was not Eldrad’s servant, his examination of her ship revealed that she had collected most of Eldrad’s fragments during her travels - albeit keeping them in stasis -, suggesting to The Doctor that Eldrad’s fragments had enough power to influence Mulkris’s behaviour. Although Mulkris claimed that she had destroyed various ‘fake’ Eldrads in the past - other body-fragments of Eldrad animated by radiation - and that The Doctor’s concerns were thus irrelevant, her confidence was proven incorrect when Gibbs arrived, attacking Mulkris and taking control of Nyssa and Kate while attempting to take control of the TARDIS to use its power to restore Eldrad. With silicon fragments converted to sand, they were able to bypass the TARDIS lock, but Gibbs’ attempt to take control of The Doctor was interrupted when Tegan and Turlough made it to the ship and created a distraction that allowed The Doctor to escape. As Mulkris attempted to contact Kastria, she confirmed The Doctor’s claim that Kastria was gone, Gibbs/Eldrad killing Mulkris when she tried to attack him with the silicon poison he had created. Although The Doctor was able to destroy Eldrad’s gathered remains by using Mulkris’s ring, the eye remaining in Gibbs proclaimed that Eldrad’s crystal fragments would spread to grow across Earth despite The Doctor’s claims that the silicon was only an aberration rather than a part of Eldrad. As Gibbs/Eldrad resolved to conquer all, he offered The Doctor a role in Eldrad’s new empire, The Doctor pretending to go along with the idea to give him an excuse to get his companions back into the TARDIS, The Doctor, Tegan and Turlough departing with Gibbs while leaving Nyssa on Earth to try and contain the crisis as the Alexander crew utilised stolen nuclear missiles to recharge the Kastrian fragments. As silicon armour grew over Turlough, Tegan and The Doctor from the injuries they had received from Gibbs/Eldrad, Gibbs claimed that the armour would turn Earth’s residents into more powerful but more obedient soldiers devoted to Eldrad’s word while Earth itself was sheathed in impenetrable quartz. The Doctor attempted to buy time by trapping Gibbs in the TARDIS boiler room, but was forced to return to Kastria to reclaim Eldrad’s ring when he realised that he had left it there, giving Gibbs/Eldrad the chance to take control of Turlough and convince him to let him out. Arriving on Kastria, the TARDIS crew discovered what appeared to be a large statue of Eldrad, but this was quickly revealed to be Eldrad himself, having climbed out of the pit where The Doctor had left him and spending the subsequent centuries regrowing his body while talking to the ‘ghosts’ of the Kastrians, apparently reanimating whatever aspects of them remained in the dust that had been their bodies. Despite the appearance of this other Eldrad, Gibbs/Eldrad attempted to don Eldrad’s ring, proclaiming that he would take control, the energy of the TARDIS resonating into Gibbs/Eldrad and recreating him in the image of a full Kastrian, intending to use Earth as the centre of his army and leave Kastria for dead. However, as the TARDIS’s energy surged through the room, faces began to emerge from the walls, the dead of Kastria rallying to ‘serve’ the true Eldrad as he attacked and killed Gibbs/Eldrad with the silicon poison, although The Doctor soon deduced that any Kastrian fragments left merely wanted to ensure the deaths of both Eldrads. As Mulkris emerged from the TARDIS - regenerated from her old ring and exposure to the TARDIS’s energy -, she used the silicon poison dart that had just been used on Gibbs to kill Eldrad, Turlough and Tegan using their Kastrian armaments to destroy Eldrad’s ring. Returning to Earth, the TARDIS crew learned that Nyssa had destroyed the Alexander to prevent the spread of the Kastrian fragments, escaping with the crew in Mulkris’s ship by using the hand of her previous body to get around the genetic control restrictions. With her ship restored, Mulkris departed to continue her search for Elrad’s scattered fragments, while The Doctor and his companions left in the TARDIS now that the threat Eldrad’s remnants had posed to Earth was ended.